Grades. Going to prom. Getting your first boyfriend. Losing and finding best friends. Graduating. Picking a college. All of these are normal pressures a teenager should feel pressing down on their shoulders as they descend into adulthood. But Natasha Martinez, 17, carries a different weight. She was one of the students at Marjory Stoneman Douglas High School who survived an attack that killed 17 of her peers and teachers. The shooting changed many things about their lives. It also introduced journalists and the media in a way none of the teenagers had experienced them before — in their homes and schools and communities clamoring for interviews and photos. It has pushed several to say they want to be journalists themselves, to right the wrongs they said they saw in the aftermath of the shooting. For Carlitos Rodríguez, 17, this revelation came after he and other students saw the same handful of their classmates on television, in the newspaper and all over coverage of the shooting. Those students, he said, were among the few willing to speak openly to journalists in the moments immediately after. Others, like him, were still working out how to describe the horror that they had just lived. But by the time they found their voice, he said, the media had moved on. 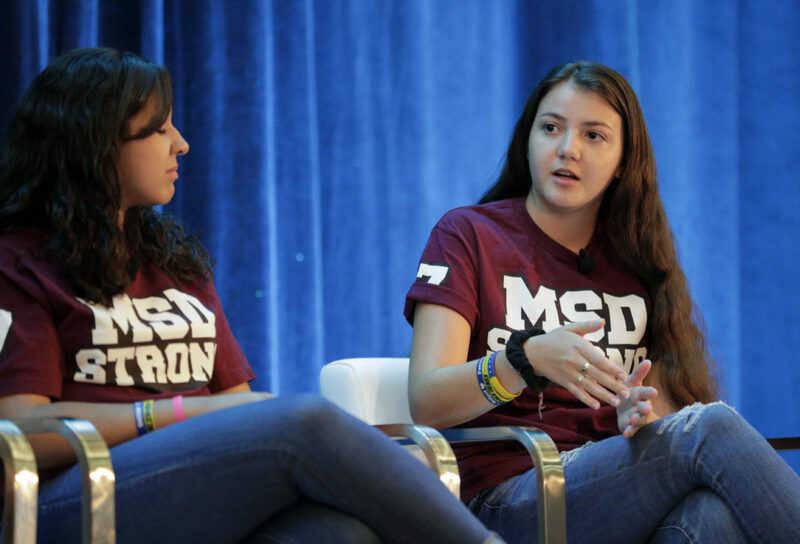 Rodríguez helped found a social media campaign called “Stories Untold” that highlights the experiences of students at Stoneman Douglas who have gone mostly unnoticed. The “Stories Untold” campaign has more than 10,000 followers on Twitter and videos with as many as roughly 400,000 views. “We put together this panel to learn how to do it better,” said New York Times reporter Frances Robles, who coordinated the discussion on Thursday. Three students sat on the panel alongside English teacher Sarah Lerner and Lori Alhadeff, the mother of 14-year-old Alyssa Alhadeff, who was killed in the massacre. On the day that students were invited back to the high school to pick up the belongings they abandoned in their scramble to safety, Rain Valladares returned to retrieve her camera. Saved in the camera were photos she took moments before the first shots rang through the halls. They were nothing special. Photos of a typical Valentine’s Day at a high school: balloons, candy and her friends hugging. But below the surface these photos represented something much grimmer. Valladores, who had already expressed an interest in photography and served on the school’s yearbook, said she realized the power of photos in that moment. She has since decided to pursue a career in photojournalism. Martinez had a similar revelation.